Vaulted great room and kitchen in open floor plan in the Linwood at Lyons. 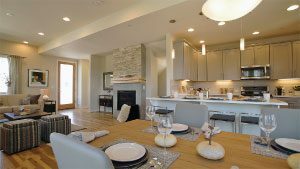 BOULDER COUNTY – Prominent glass, gleaming hardwoods, inviting outdoor living areas, and the ease and beauty of an open floor plan are on display in the entries from Markel Homes in this year’s Flatirons Tour of Homes, running for a second weekend this Saturday and Sunday, May 14 and 15. Start your tour in the ranch-style single-family Linwood in Lyons Valley Park. 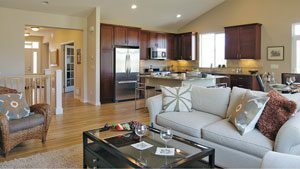 Head east to Longmont’s Prospect New Town neighborhood to tour a town home in the newly completed five-plex on Confidence Drive, and end your outing with the Falcon, Markel’s newest model at North End in Louisville. Large-paned south-facing windows flood the open main floor in soft natural light in Markel’s contemporary town home five-plex in Prospect. Imagine the day beginning with sun salutations on the semi-private deck, accessible from the desirable main floor master suite, followed by coffee and a smoothie at the rectangular island with seating for four. High-quality cabinets – and lots of them – solid surface countertops and stainless steel appliances, including a gas range, elevate the kitchen to gourmet status in a floor plan well-suited for entertaining. Open concept kitchen and living area offer soft natural light at Prospect New Town. Thirteen-foot ceilings create a bright and airy master suite, with five-piece bath, large walk-in closet and access to the deck. The upper level features a loft at the top of the stairs – ideal as a lounging, media or tech area – two bedrooms or office space, a full bath with double-sink vanity and pocket door to tub and toilet, and a hall linen closet. 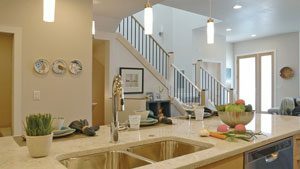 Finishes include hardwood flooring on the main level, tile in every bath, a gas fireplace in the living area, and a handsome, contemporary staircase with metal balusters and natural maple railing and caps. The five-plex incorporates a flat-roof design and contemporary styling to complement Prospect’s bold and stunning streetscape. A half-flight of stairs leads to the covered front porch. Across the street sits one of Prospect’s neighborhood parks and beyond, the Flatirons. The lock-and-leave convenience of town home living is particularly attractive in this walkable community, with restaurants, shops and services around the corner or up the street. Markel’s Prospect New Town sales center is located near the five-plex at 918 Half Measures Drive. Sales Manager Marlita Lazo will be on-site from 11 a.m. to 5 p.m. this weekend. She can be reached at 303.522.7028 or by e-mail to Marlita@MarkelHomes.com. The three interior town homes in the five-plex have sold. The two end units, as described in this article, are available for $649,900. Markel has started construction on several single-family homes in the next phase of building at Prospect. Lots are also available for purchase for custom homes. The quaint and delightful Linwood offers an array of desirable features, including the single-level convenience of a main floor master suite. The vaulted great room, dining area and kitchen flow in an open plan anchored by a large, square-shaped island that’s perfect for casual dining and entertaining. Bedrooms two and three share a full bath, creating privacy for guests or an ideal at-home work space. The unfinished and plumbed lower level provides ample space for a future rec room or media hangout, fourth bedroom and third bath. The Lyons Valley Park sales center is located in the Linwood model at 334 McConnell Drive in Lyons. Markel Homes is gearing up to release thirteen new lots in Phase V at Lyons Valley Park, including larger lots ranging in size from 6,900 to more than 13,000 square feet and a selection of premium lots that back to open space. The Phase V infrastructure is nearly completed, with two of the Phase V homes under contract. Just fifteen minutes from Boulder, Lyons offers an outdoor lifestyle with easy access to hiking and biking trails, mountain activities, great schools, and a lively food and music scene, all set in gorgeous natural surroundings. For more information about Phase V and to learn more about the Linwood, contact Sales Manager Marlita Lazo by phone at 303.522.7028 or e-mail Marlita@MarkelHomes.com. The Lyons Valley Park sales center will be open for the Tour of Homes this Saturday and Sunday from 11 a.m. to 5 p.m.
Beautiful hardwoods and contemporary lighting in the Falcon at North End. Contemporary windows in varying shapes, sizes and combinations and the home’s bold newwest architectural styling give the Falcon its unique personality in a streetscape loaded with great-looking homes in a variety of single and two-story styles. The Falcon’s open floor plan enhances the feeling of spaciousness in the main-floor living, kitchen, and dining areas. Cooking and entertaining are a delight in the well-equipped U-shaped kitchen with extended counter. The upper level features three bedrooms, including the master suite with five-piece bath and walk-in closet, plus laundry room and linen closet. Windows surround the master soaking tub. Glass also appears above the tub in the second bath, on both exterior walls of all three bedrooms, and in the laundry room. Like the majority of Markel products, the Falcon features an unfinished lower level for future living and sleeping quarters. Located at 1502 White Violet Way, the Falcon, in addition to being in this weekend’s Tour of Homes, will serve as a model for the upcoming Block 10 at North End. The neighborhood’s award-winning Cascade Sales Center at 1805 Blue Star Lane will also be open this weekend. Hours are 11 a.m. to 5 p.m. Contact Sales Manager Michele Steward by phone 303.604.9196 or e-mail Michele@MarkelHomes.com for more information. To learn more about the available properties from Markel Homes in neighborhoods throughout Boulder County, including Kalmia38 in Boulder and the lots at Niwot Hills and Spring Creek in Lafayette, visit the company online at MarkelHomes.com. You can also follow Markel on Houzz.com and Facebook. For more information on the Flatirons Tour of Homes, visit flatironstourofhomes.com.